This winter, Rye High?s wrestling team has gone from being one of Section 1?s weak sisters to a major player. After seasons in which only a handful of athletes were available for matches, necessitating forfeits at many of the weight levels, the Garnets are deep up and down the lineup and optimistic that, with their record currently 5-5, the 2018-19 season will be a winning one. A major player in that resurgence has been senior captain Tyler Webb, who sports a mid-season 12-3 record in his individual bouts at 220 lbs. It?s why the Rye Lions Club and Rye?s Athletic Department have jointly named young Mr. Webb Rye?s Athlete of the Month for December. An All-Conference linebacker and guard who co-captained Coach Dino Garr?s football team that reached the Section championship game, Tyler is a returning All-Section performer on the mats as well, ?one of the hardest working individuals in the room.? Those are the words of Rye?s second-year wrestling head coach Joel Jenson. In nominating his star athlete for the award, Coach Jenson added, ?Tyler expects a great deal of himself. And now, Cornell University will as well.? Asked why he accepted admission to the upstate Ivy, Tyler said, ?I want to be an engineer, and they have a strong program. They also have Naval ROTC, something I?m considering doing.? With a course load that has included Advanced Placement History, Latin, and five classes?Chemistry, two levels of Physics, Engineering, and Robotics?all taught by the same teacher, December?s honoree had nothing but praise for his science mentor. ?Mrs. Leahy was an engineer herself, so she knows what she?s talking about. And knows how to teach it.? A member of both the National Honor Society and the National Music Honors Society (he plays the bass clarinet), Tyler earned the distinction of Scholar-Athlete last year on the Garnets? lacrosse team. 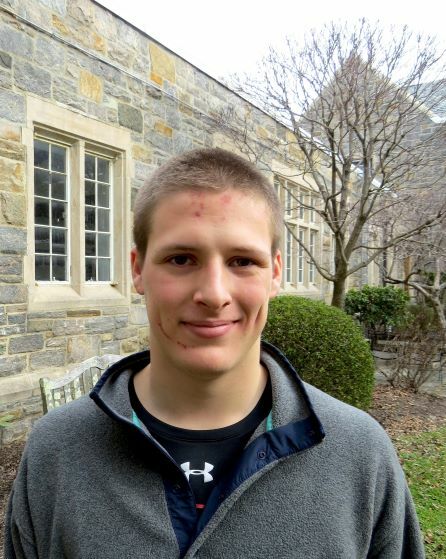 As a goalie and defenseman, he competed in invitation-only lacrosse tournaments up and down the East Coast as a member of the after-school Westchester Predators Club. His other after-school clubs include the Cancer Awareness Club and the Adopt-a-Soldier club that writes individual servicemen and women letters of thanks for their service. He?s a Junior Board member of the Campfire Club of America based in Chappaqua, a group that promotes conservation of our natural resources. He said, ?My Dad is really into the outdoor lifestyle.? Tyler was asked if his interest in science and engineering was also fostered by his parents. ?My Dad ?s a financial guy. He says he doesn?t know what I?m getting myself into, but he supports me all the same.? Winning this monthly award earns Tyler Webb an invitation to the Lions? year-end dinner at The Osborn, when Rye?s Athlete of the Year will be announced.